In 10 feature-length stories, all of which examine Great Smoky Mountains National Park-specific themes, GSMA’s spring Smokies Life looks at some of the earliest efforts to establish a national park in the eastern U.S., business endeavors that failed to take root in and around the park, and the impact climate change is having on the Smokies today. With GSMA’s planned release of Back of Beyond: A Horace Kephart Biography also slated for April, Smokies Life provides readers with an excerpt from the book, which takes a closer look at the man who helped lead the group effort to convince the U.S. government to create a national park in the Smokies. Staying with the history theme, retired University of Tennessee librarian Ken Wise looks at the women responsible for founding Pi Beta Phi Settlement School in Gatlinburg, Tenn. “Support for childhood education had been a stated mission of the Pi Beta Phis, and the opportunity to start a settlement school would be a bold initiative in fulfilling this mission,” he says. Climate change’s impact on the park, coupled with an examination of why this national park remains one of only a few without an entry fee was a strategic grouping of topics, Figart said. “Trout fishing in the Smokies” by former GSMA staffer Steve Kemp introduces readers to some of the most legendary Appalachian fishers who share their secrets for catching “the big one” in the park’s most elusive waterways. “Decoration Day at the North Shore cemeteries” by author Courtney Lix takes readers across Lake Fontana to learn more about why a group of people feel the need to advocate for regular access to these remote cemeteries. 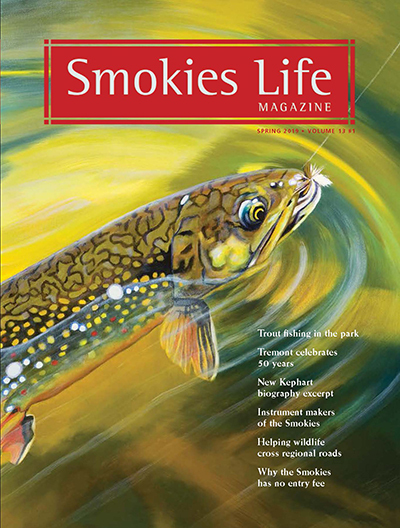 Published for the last 13 years in the spring and fall, GSMA’s award-winning Smokies Life magazine is a free benefit of becoming a Great Smoky Mountains Association member at any level. Others may purchase Smokies Life at any Great Smoky Mountains National Park visitor center store or online at SmokiesInformation.org. Great Smoky Mountains Association is a nonprofit partner of Great Smoky Mountains National Park with a mission to promote greater public understanding and appreciation of the park of through education, interpretation and research. Proceeds from visitor center sales and membership dues from more than 28,000 members has allowed GSMA to contribute more than $42 million to national park program support since its inception 65 years ago.